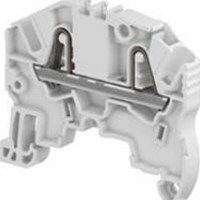 The ABB SNK Series Type ZK2.5 PI-Spring technology terminal blocks feature "push-in" wire insertion, 5.2 mm spacing and a large flat marking area. ECD has a large inventory of ABB Terminal Blocks in stock and ready to ship. ECD also provides custom terminal markers and engraving as well as custom terminal block assemblies. Call ECD for all your terminal block needs.